Wow – I must be doing something right, because I got a repeat customer! I also got a lesson in canvas printing thrown into the deal. 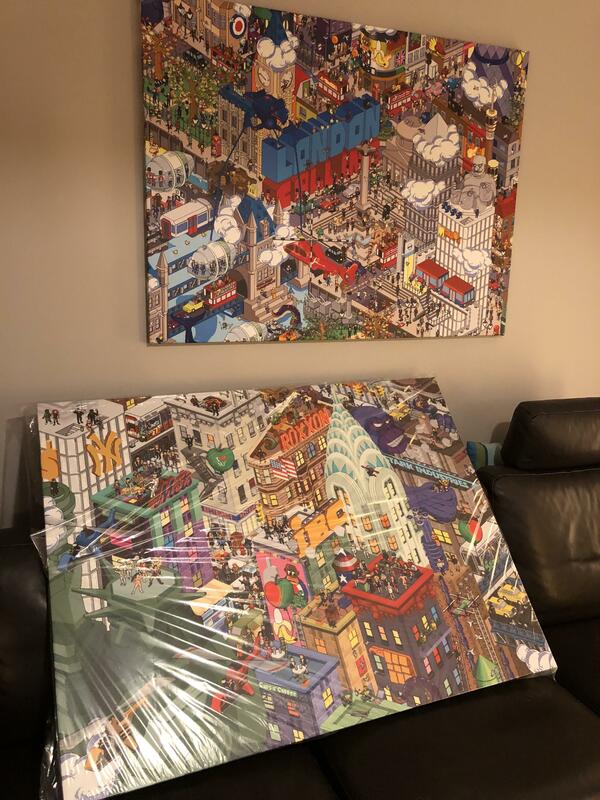 I was asked to supply a canvas of my London Calling pixel art in 2016. The request was for the largest size possible and so I found a company that could handle this. At this point, I was rather green and had no idea about things like trade deals, and so I cut my losses and – because the printing was so expensive and I had no idea whether he’d be happy with the end result – I decided to make no profit at all on it and just have the client cover the costs. Fast forward to now, and at least I’ve made a small profit on the sale of the first New Your canvas – unfortunately not as much as I’d hoped because I was stuck using the original printers. I’d since found an rganisation that provides a good trade discount, however they don’t povide the option for the same dimensions as the first print, and they really needed to match. On the other hand, I can’t deny that they look far nice as canvases than as posters, and so I’ll definitely add the canvas option to my Etsy store.